In a bowl, mix 1 the ‪peanut ‪‎butter and ‎yoghurt together. 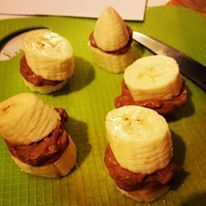 Chop up 2 ‪bananas into pieces and spoon a little mixture in between. Place in the freezer for at least 2 hours before eating. Yum!